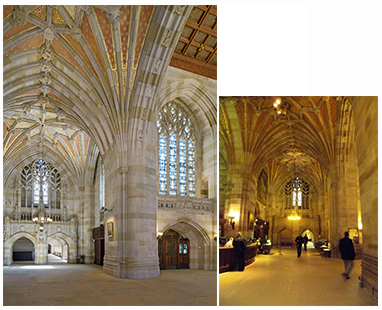 At the symposium announcing the 2015 AIANY Design Awards, the Nave of Sterling Memorial Library at Yale University was the sole historic preservation project recognized. Awardees are selected for their “distinguished achievement”; there were 35 winners out of almost 400 submissions. After two days of deliberation, the international jury gathered at an evening program to announce and comment on how each winner “uniquely contributed to the design conversation.” The panel was moderated by Beatrice Galilee, Associate Curator of Architecture and Design at the Metropolitan Museum of Art. Caption: The Jury displayed these before and after views of the Nave’s renovation to show why the Nave received an award.